The measurement intervals of the measured I/O data must overlap exactly. Check the sync source setting. For example, route the input to a three-phase device under measurement to input elements 1-3 on the power meter, and the output to elements 4-6. Set the sync source on elements 1-3 to the current or voltage of element 1 (I1 or U1), and the sync source on elements 4-6 to the voltage or current of element 4 (U4 or I4). In a case when inputting three phases to elements 1-3 and DC to element 4, set all sync sources to current or voltage of element 1 (I1 or U1). Measure characteristics of devices that generate, transform or consume electricity. 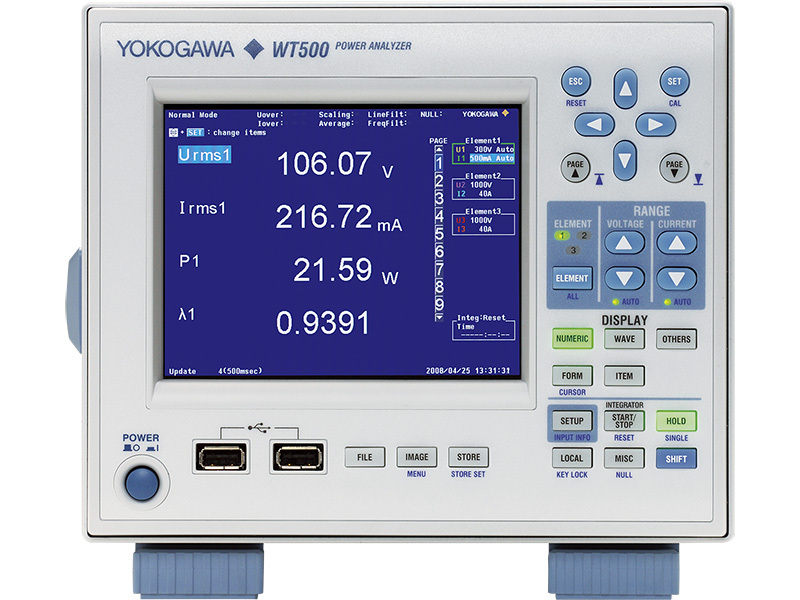 Also called power meters or wattmeters, these devices measure parameters such as true power (watts), power factor, harmonics, and efficiency.